Nasco Sketchbook Assortment - 80 Sheets 65 lb. 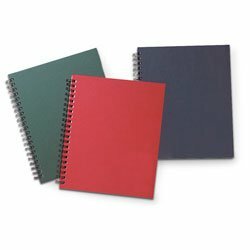 - Youth and After School Education Program - 9720393: Assortment of 24 spiral 8-1/2" x 11" sketchbooks in three colors (eight each of red blue and green). White paper micro-perforated for easy removal of pages. In 1941, Nasco got its start by filling a need for teaching aids that were not readily available from any other source. To this day, we are proud to carry on that tradition and serve customers throughout the United States and abroad with the products they need, the quality they expect, and unbeatable customer service, all at prices they appreciate.